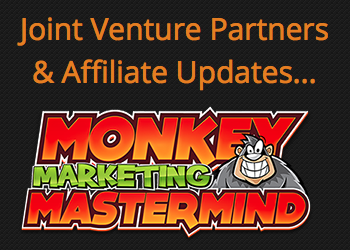 Simon Hodgkinson + Jeremy Gislason – Monkey Marketing Mastermind Affiliate Program JV Offer, More. Welcome to the JVNP 2.0 Update featuring a primary JV request courtesy of fellow JVNP 2.0 Partners Simon Hodgkinson + Jeremy Gislason (Monkey Marketing Mastermind – JVZoo affiliate program JV invite), Buzz Builders (Marc Goldman – JV Brokering Mastery launch) and More … in Today’s when it comes to profiting online, Simon & Jeremy don’t monkey around edition. Fellow JVNP 2.0 Partner, we’re excited to announce that this Summer we’ll be releasing a truly game changing collection of secret marketing tactics that have netted us over $1Million Dollars in EXTRA revenue this last year! The collection, ‘Monkey Marketing Mastermind‘ is a game-changer. Your referred customers can be one of the first to step inside and discover the secrets guaranteed to dominate any marketplace and send their income hurtling through the roof! Fear Factor Fortunes: Shockingly Powerful Conversion Boosting Tactics. The Intensifier: Discover How To Instantly Elevate Any Business/Brand. Commission Miner: How To EXPLODE Affiliate Commissions. Traffic Splash: How To Start An Unstoppable, Viral Traffic Cascade. List Monster: The Real Secrets To MEGA List Building Profits. Plus, during the launch phase only, they’ll receive reseller licenses and stunning marketing materials (including individual sales videos) to each course – It’s a double whammy of cutting edge training and valuable products to profit from all rolled into one amazing deal. The price point is set to start a launch frenzy and you’ll be left struggling to count up your commission payments. 1) The marketer/online business owner looking for cutting edge ways to improve their businesses and profits, and 2) experienced marketers/opportunity seekers who demand high quality training to sell to their customers via licensing. Behind our main offer we are offering a collection of new and amazing SAAS based marketing software tools – These tie directly into the video tactics revealed inside the main offer and will benefit everyone that upgrades by short-cutting the entire tactic implementation process with fast, simplified (non-techy) ways to speed up their results. Affiliate partners can earn up to $236 for every referred buyer and on top there’s thousands of dollars in cash prizes up for grabs in our main competition and special contests. We look forward to working with you and welcoming you to this super-profitable launch. Make $750/sale Clickbank commissions promoting eFormula Evolution from Tim Godfrey, Ryan Coisson, Steve Clayton, Daniel Audunsson & Aidan Booth. Incredible $300,000K/month profit PROOF with Huge EPC’s & Exceptionally low refunds. Please visit the JV Page (link below) for all the details. Your customers will love you when they learn my 10 Step JV Brokering Mastery System that shows newbie to mid level marketers a 10 step system for how to broker, setup, and manage JV Deals.! 70% FE & 50% Multiple BE. Check out the JV page (link below) for all the details. Join Mark Thompson & Adam Short (Niche Profit Classroom) as they team up to launch Keyword Advantage to the Public. Make $332.50+/Sale. Never-Before Released to the Public, Hot Software + Proven Continuity Program for Enhanced NPC version 5.0! Over 32,000 Members Already and Counting. What Do DC Fawcett, Old Tree Publishing, Chad Mureta, Alex Mandossian, Adam Horwitz, Ty Cohen, Jason Fladlien + Wilson Mattos, Len Wright + Matthew Lutz and Talor Zamir + GoMobile Solutions (Damien Zamora) Have In Common? Georgi Georgiev, Adam Horwitz & SqueezeMobi, Josh Bartlett, Bryan Winters, John Pearce, Christian Fea, Greg Jacobs, Matt Wolfe and other fellow JVNotifyPro 2.0 partners are waiting in the wings … keep your eyes on your Inbox, and follow the action in the JVNP 2.0 Premium VIP JV Announcement archives. Posted in Joint Venture Announcements	| Tagged Affiliate Marketing, Affiliate Program, Affiliate Program Directory, Affiliate Programs, Attract Affiliates, Attract JV Partners, Best JV Brokers, Buzz Builders, Find Affiliates, Find JV Partners, Home Business, Internet Marketing, Jeremy Gislason, Joint Venture Blogs, Joint Venture Forums, Joint Ventures, JV Announcements, JV Blogs, JV Brokering Mastery, JV Forums, JV Invite, JV Launch Calendar, JV Product Launch Calendar, JVNewsWatch, JVNotifyPro, JVZoo, Launch, Make Money Online, Marc Goldman, Marketing, Mike Merz Sr, Monkey Marketing Mastermind, New Product Launches, Niche Marketing, Online Business, Product Launch Calendar, Simon Hodgkinson, Work At Home	| Comments Off on Simon Hodgkinson + Jeremy Gislason – Monkey Marketing Mastermind Affiliate Program JV Offer, More.